Bet Texans -6 over Jets with Karamba. Bet Raiders +3 over Bengals with 888Sport. Bet Colts -3 over Cowboys with Betfair. Bet Jaguars -7 over the Redskins with 888Sport. Week 14 was a profitable one for us (and NFL betting readers who joined along) as three of four ATS picks connected. Let’s take a closer look at the Week 15 card and see if we can keep up our winning ways. The Texans had won nine straight games before losing at home to Indianapolis this past Sunday. Now they know they need to win to get back on track and wrap up the AFC South championship. 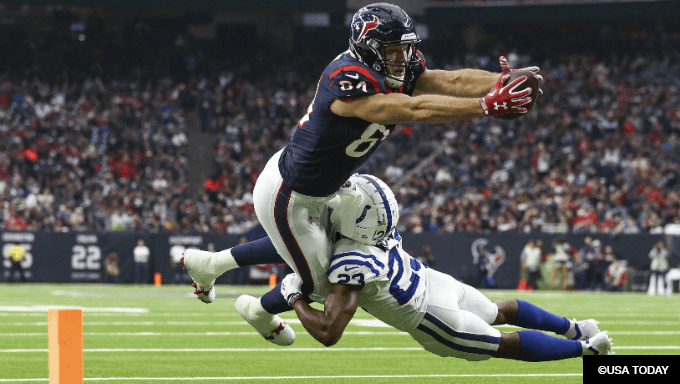 The Texans are in an interesting spot here as last week’s lost didn’t burn them so much because the teams they are jockeying for position with – the New England Patriots and Pittsburgh Steelers – also lost. What’s even better for the Texans is that the Patriots and Steelers square off this week, so if the Patriots lose, the Texans can move up to No. 2. If the Steelers lose, the basically lock up a top-three spot. The Jets did get a win last week but it was their first in seven games. And they were mostly lucky to get it as they were outgained 368-248 in yards, 24-15 in first downs and 33:47-26:13 in time of possession. Rookie quarterback Sam Darnold had just 170 passing yards, which is pretty ugly. At a touchdown or more, I wasn’t interested in laying the points. Now that it’s dropped down, I’ll take the Texans at Karamba. The Bengals did play the Chargers close, which could lead many to think that they will be ready to win this game at home. However, it was a sandwich game for the Chargers as they were in between a big win over Pittsburgh and looking ahead to the Kansas City Chiefs. Meanwhile, the Raiders are clearly playing their best football of the year. That doesn’t mean they are playing well on an objective scale, but it does mean they are getting better under coach Jon Gruden. They defeated the Pittsburgh Steelers last week and played the Kansas City Chiefs close the week before that. Few people thought they would be able to grow and develop as the season moved along but it’s happening. In a game which figures to be very close, I like the Raiders since they are the team getting a few points. Oakland isn’t an airtight pick, but they are the side that makes sense. Take the Raiders +3 with 888Sport. The Dallas Cowboys have won five games in a row to put themselves in great shape. However, I see this as a bit of a letdown spot for them for a few reasons. To start, the Cowboys are finally in a secure position to make the playoffs. When they were 3-5, head coach Jason Garrett was taking a lot of heat as the playoffs were off in the distance. Now the Cowboys have basically won the division and are in the most comfortable spot they’ve been in all year. Secondly, the Cowboys are coming off an overtime win over a rival. They’ve registered two big division wins in the last three weeks along with the Saints win in between. They might not get up for a non-conference game as much. The Colts need this game. They also come in with a defense that’s allowing just 3.8 yards per carry (sixth in the NFL). If they can slow down Elliott, they’ll can pick up the win and cover here. Take the Colts -3 with Betfair. The Jaguars are a total mess. Some weeks they’ve quit, other weeks they’re still trying. However, they are an easy choice against Washington. That’s how bad the Redskins are right now. Washington is dusting off some ancient fossils at quarterback, first Mark Sanchez and now Josh Johnson. Sanchez threw for only 38 yards this past Sunday against the Giants, tossed two interceptions, and got benched in favor of Johnson, who had not played a regular season NFL game in several years. The Washington offensive line has been ravaged by injuries. The Redskins trailed the Giants 34-0 at halftime, at home, this past weekend. They should make the Jaguars look good. It's worth adding that the Jags are 3-4 at home versus 1-5 on the road, so they have hung tough at home. They also allow just 13.5 points per game at home, which is the best mark in the league. Take them in this spot with 888Sport.